Peru is to launch a “Climate Change Trail” around shrinking Andean glaciers in an attempt to bring back tourists while educating them on the impacts and dangers of climate change. 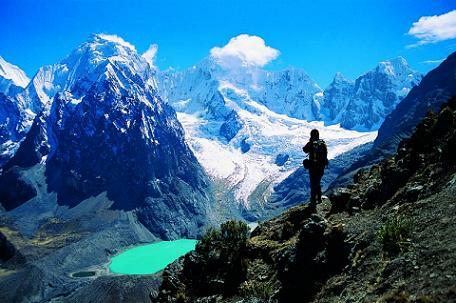 Huascarán National Park, home of the new “Climate Change Trail”, is already a popular tourist destination in Peru thanks to its spectacular views of glacier-topped mountains. Photo courtesy of absolut-peru.com. Despite being one of the most vulnerable countries in the world to the impacts of climate change, Peru is launching an eye-catching alternative initiative to use this fact to boost numbers in its important tourist industry, with the opening of a new “Climate Change Trail” which was announced last year. The new “attraction” is set in the snowy peaks of Huascarán National Park, home to hundreds of glaciers and soaring Andean mountaintops, as well as mountainous forests and various unique ecosystems, in the Áncash region in the north of Peru. The spectacular views, rich history and cultural heritage, and extreme-sports options all combine to make this part of the country a popular alternative tourism destination. Until recently the snow and glaciers that top the region’s mountains were considered “eternal”, but climate change has rendered this suggestion a thing of the past, and may well do the same to the glaciers themselves if current trends continue. Ice fields in this and many other regions of Peru, which is home to 70% of the world’s tropical glaciers, have lost as much as 30% of their mass since the 1970s, with one result being a drop in the number of tourists visiting Huascarán each year falling from as much as 100,000 in the 1990s, to just 30,000 today, as the receding glaciers give way to the far less aesthetically attractive sight of bare rock and pools of icemelt. It is with this in mind that Peruvian authorities, led by the Servicio Nacional de Áreas Naturales Protegidas por el Estado (Sernanp – National Service of Natural Areas Protected by the State), have devised a way of bringing flocks of tourists back to Huascarán while providing an education on the causes and effects of climate change on the Andes, Peru, and beyond. The Climate Change Trail leads to the iconic Pastoruri glacier, named after the mountain it straddles, which has been a key tourist attraction for decades due to its relatively easy accessibility, but which has come under attack from climate change in recent years. It has reportedly shrunk by about half in the last 20 years, and in 2007 it split in half before another major chunk broke off in 2012. 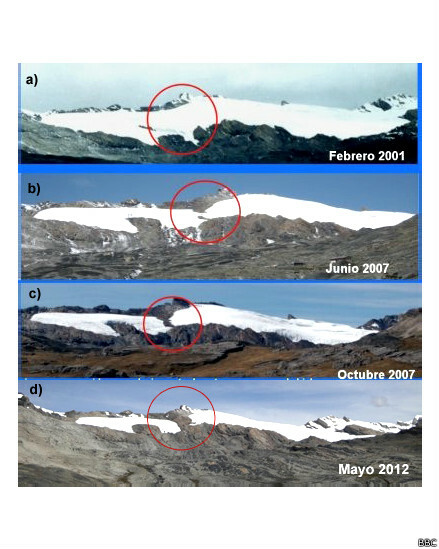 Images from Sernanp (via the BBC) show the retreat that the Pastoruri glacier has suffered in recent years. Despite these devastating consequences, Sernanp claims that for all the pessimism over the impacts of climate change, it has actually helped to spark an interest among touristic circles, with people wanting to get up close and personal with the more obvious sites where the battle between nature and man-made climate change is being fought. To this end, the Climate Change Trail has a strong educational element, incorporating viewpoints where visitors are able to see how the glaciers at Pastoruri and other sites are being drastically harmed by the onset of global warming. The new route begins in a Climate Change Trail Centre of Interpretation, where presentations involving talks and videos are offered to visitors, explaining to them how climate change is already affecting many different parts of Peru, Huascarán included. “The idea is to generate a stream of information on this new proposal, where visitors can observe where the glacier stretched to in years gone by, as well as the location of what was the well-known cueva de hielo (ice cave)”, a press release from Sernanp stated. Furthermore, a viewing point has been set up where tourists can “take a look at the effects of climate change, reflected in the retreat of the glacier”. The route also takes visitors past various other sites including the sub-basin of the River Pachacoto and its “ancient lagoon”, as well as many other bodies of water which have been around for far less time: pools and lakes formed from the melted ice of the receding glaciers above them, which have apparently increased their size 44 times over since 2001. 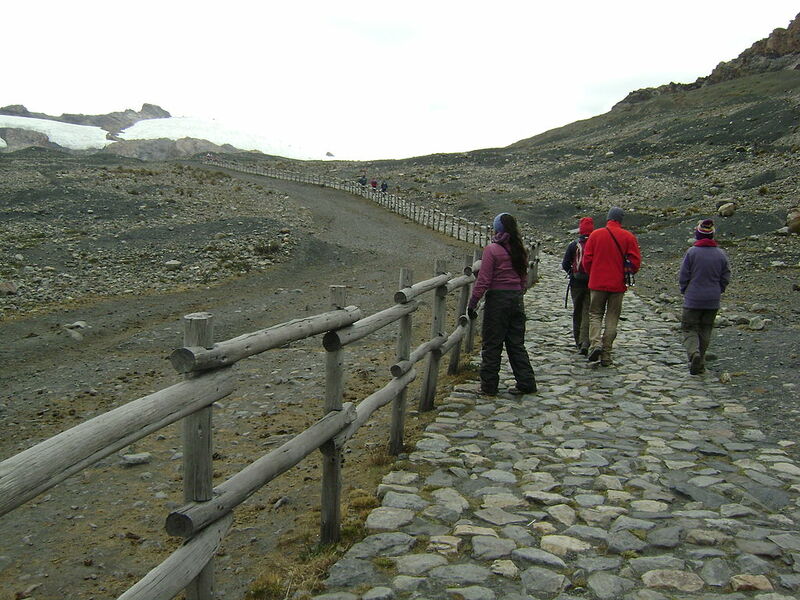 The trail finishes up near the Pastoruri glacier itself, where visitors are also offered a perspective of much longer-term climatic changes in Peru by the presence of fossils belonging to dinosaurs and other ancient creatures which once upon a time roamed the plains and plateaus of South America. One of the existing trails leading up to the Pastoruri glacier. Photo via Wikimedia Commons. Sernanp, which has collaborated with Peru’s Ministry of Tourism as well as other local organisations in order to bring the new Climate Change Trail to life, says that the project is designed to take advantage of niches in the global tourism industry, with more and more important players in this “sophisticated” market vying to offer customers a different and more intrinsically valuable experience. It also claims that Peru’s areas of natural beauty “have become a touristic opportunity offered by [the country’s] adaptation to climate change”, in reference to the way in which the impacts of climate change on Huascarán National Park have actually inspired this new venture. The trail can hopefully increase education and awareness on the impacts of climate change on Peru’s glaciers, but the country is also vulnerable to these impacts in other areas far away from the lofty peaks of the Andes. A recent report also carried out by Sernanp, titled “Climate Change and Forest Wildlife in the Peruvian Amazon” and which had been seven years in the making, has shed light on the impacts of climate change on biodiversity and population levels in the Peruvian Amazon (link to pdf in Spanish). The report explains how river levels in the Pacaya-Samiria National Reserve rose to one of the highest ever recorded in 2009 as a result of exceptional rainfall, before falling to record levels the following year in one of the most extreme droughts the Western Amazon has ever experienced. In 2011, though, it was the turn of heavy rainfall again and river levels exceeded those of 2009, before in 2012 rivers reached their highest levels ever recorded. The fluctuations in seasonal weather patterns are blamed on climate change, and resulted in population decline among many of the region’s species, with knock-on effects further down the food chain that also affected local indigenous Cocama populations. 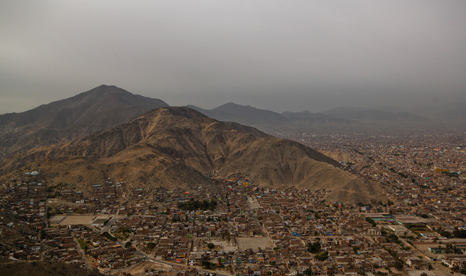 Lima, the capital of Peru, is one of the driest capital cities in the world, and could be vulnerable to changes in water availability as a result of climate change. Photo courtesy of Geraint Rowland via Flickr. On the other side of the Andes, Peru’s coastal regions and Andean foothills are exceptionally dry, with Lima being one of the driest capital cities in the world. This means that not only are many important population centres in Peru at risk of drought and further desertification, but they are also overly dependent on the rivers that flow down from the Andes to the Pacific Ocean. However, since many of these rivers originate from glaciers, the long-term threat posed to these glaciers by climate change is also a serious threat to the rest of the country, which as a result may suffer from severe water insecurity by the end of the 21st Century. Because of all this, Peru has plenty of reasons to take climate change deadly seriously. However, its lucrative tourism industry based on drawing in people from all over the world to marvel at its natural wonders means that it is also in a potentially powerful position when it comes to projecting these concerns to the wider world. The Climate Change Trail could become one important feature of its attempts to influence global efforts to take note of the very present and real threat of climate change, but perhaps the country’s greatest opportunity to do this will come at the end of this year, when Lima plays host to the 20th Conference of the Parties (COP) to the UN’s Framework Convention on Climate Change (UNFCCC), widely seen as the world’s most high-profile summit on climate change.